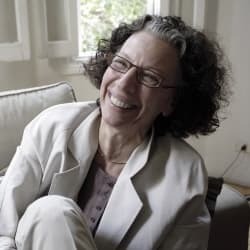 A master of documentary forms and aesthetics, Tahani Rached has made nearly 20 films in her 38-year career that exemplify the skills and commitment of our best documentarians: a passion for justive, a profound curiosity, a genuine respect for people, and a delight in the craft of non-fiction storytelling. Born in Cairo in 1947, Rached immigrated to Canada at the age of 19 to study painting at Montreal’s Ecole des Beaux-Arts. Coming of age during the heady political and social activism of the late 1960s resonated with the equality fostered by her family in Egypt. She left the painting studio to work with activists and on media projects with the newly formed Third World Newsreel. In 1972, Rached co-directed Pour Faire Changement (To Make Change) on the history of Quebec’s working class. In 1979, she found the perfect medium to express both art and activism with her first documentary, Les Voleurs de Jobs (Job Thieves). This was followed by a series of six half-hour documentaries for Radio-Québec on Quebec’s Arab community. She joined the National Film Board of Canada as a staff director in 1980 and for 24 years made a number of outstanding films with the NFB that remain as vital and relevant today as when they were first created. Eschewing simple ideology or dogma, Rached’s films compassionately reflect a profound curiosity into people whose lives are marked by conflict, upheaval, and social struggle. Rached’s ability to listen, empathize, and engage with her subjects creates the essential trust that allows them to fully share their inner worlds and emotions. Whether they are poverty-stricken civilians devastated by war in Beirut, doctors working to treat AIDS patients in Montreal at the beginning of the epidemic, Haitain immigrants in Quebec, the marginalized poor of Montreal who start a restaurant and sing about their lives, young girls living on the streets of Cairo, or the scions of powerful who once ruled Egypt, people of all cultures and classes open up to her and her camera to share their ideas, personalities, and lives. Rached’s commitment to social justice and empowerment converges with her interest in women’s experiences in four extraordinary films. Four Women of Egypt (1997) features four women who met in prison as young revolutionaries in 1952 and debate their political and religious differences, In Emergency! A Critical Situation (1999), emergency room nurses talk – and sing – about the effects of severe funding cuts. Hot Docs had the pleasure of presenting her in-depth portrait of a Palestinian woman and her family living under occupation in Ramallah in Soraida, A Woman of Palestine (2004), while the vibrant, sassy, and compassionate These Girls (2007) follows girls who live on the streets of Cairo. Music acts as a spiritual and unifying force in Rached’s documentaries, both as a subject and within the sound design. In 1982, she made the short fiction film Furious, about a young woman whose world is transformed when she is given a Walkman. In Au Chic Resto Pop (1990), Rached mutates the conventional documentary form into a toe-tapping “docu-musical” that Bill Marshall, critic and author of Quebec National Cinema, has called “one of the most accomplished socially engaged documentaries of the decade.” In For a Song (2001), the power of music is the subject as the members of a Montreal amateur choir describe the joy and spiritual sustenance they receive from their involvement in the choir. A director with dual citizenships and lived experiences in multiple countries, cultures, and languages, Rached is a master of many film languages and techniques who mixes classic observational and participatory cinema with a creativity appropriate to each film. As a body of work, her films epitomize an emerging Canadian transnational documentary cinema. Rached currently lives in Cairo and continues to create films with Egypt’s Studio Masr that are winning international acclaim. Selecting films for this retrospective from her intelligent and compassionate body of work was a challenge. The archival and music rights have expired to some films and others are available only in archives. But we are delighted to offer this selections of powrful works that represent her creativity, commitment, and mastery of documentary forms and aesthetics over the past three decades. In conjunction with this retrospective, a number of Rached’s other films will be available for viewing online at the NFB.ca website during the Festival, and we are thrilled to screen a Special Presentation and North American premiere of Neighbors, an eloquent and fascinating history of modern Egypt told through architecture and a river of memories. We invite you to join Tahani Rached to experience and discuss these extraordinary films.